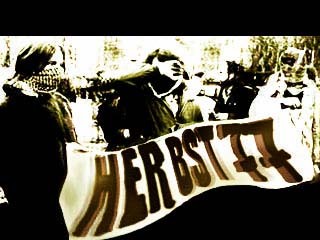 herbst 77. the time of political motivated left terrorism in germany. is from the singer degenhardt i appended below. captured a lufthansa-plane (´landshut´) to strengthen their (***demands***). over, with most of their members being imprisoned or dead. we excuse that we release this demo a week after it won the evoke party. a lot of bugs in the playback routines and also one severe memory leak. 44khz 16bit stereo. but now, why is it so computationally expensive? playback code from him. however he took his code from mp123, too. also open jpeg group is credited for their jpeg lib. we respect the following groups for their work and actions. von bloedem haschisch grinsend eure gesetzlosen gesetze vor euch hinlallt. und einfach ausprobiert was richtig laeuft. die ihr den lack mit dem die architekten ueberpinselt runterbrennt, von allem rissigen gebaelk. napalm noch die speise fuer die armen ist. and napalm is still food for poor.